Kenneth Hughey. I was born in Kissimmee, Florida. How did your family come to this area? John Hughey came from Tattnall County, Georgia about 1845 to the Seminole County area which was still Orange at the time. His son James Perry followed him down a few years later, arrived in Orlando about 1855… and he homesteaded a 160 acres on Lake Lucerne… and started continuing his family here. James Perry Hughey, seated center, with his family near Lake Lucerne, circa 1860’s. A lot of his other brothers and sisters had also moved down in this area. But the next generation moved on down to Osceola County. Thomas Hughey was one of his sons who was my great grandfather. Of course, James Perry, has quite a history here with Orlando. He was – 1870 – he was elected the first clerk of the circuit court – 1875 – he was elected the clerk of the City of Orlando court. But he maintained his circuit court position until 1880. So for the time period here he was doing both. He was also the treasurer at that same time of the Orange County Public School Systems. So he’s got quite a history here. His daughter, I forgot which one married Cassius Boone. Had a big Boone Hardware Store, the families of the Boone High School…. His father come from Tattnall County, Georgia just west of Savannah. All the Hughey’s go back to Abbeville, South Carolina area. 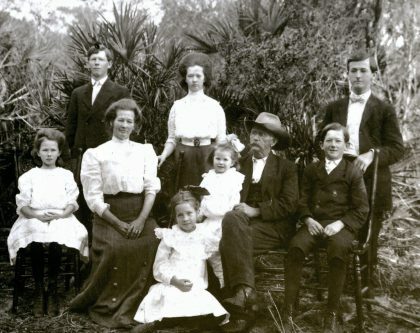 And somewhere in the early 1700’s another John Hughey, grandfather of the one in Sanford came from Ireland in the 1740’s, 1750’s… John Hughey come to Sanford area… this is 1845-46, brought his wife, and large family, and all his slaves with him. So there’s quite a few slaveholders in my family way back. And, they settled, he got a 160 acres around what is known as Wekiva, the Wekiva River. Started a big orange grove. He invested in some property. They owned a lake up there in what was called Melonville at that time. And he got into receiving goods from the steamboats that run up and down the St. Johns. So he had a warehouse up there. He was mainly into the orange business where he bought 260 acres out on Wekiva Springs. Him and his wife are buried in an old, old cemetery in downtown Sanford. I’d have to look up the name of it, but it’s behind All Soul’s Cemetery…. He had two daughters at a young age that were killed in a carriage accident and they’re buried right next to him. And then he had another daughter that was married; married a guy by the name of Alex Martin and they had two daughters. And those two daughters were with the other two when the carriage turned over and all four children were killed in the carriage. And they’re all buried, Alex Martin and his wife, Mary Hughey, if I remember right, and their two children are buried in the next lot. Of course, James Perry, I call him J. P. out of habit, he had another brother named John that started working on the river boats back and forth up there. At a young age, 14, which I’m assuming at that time, it was kind of, if you was 14 you were able to go to work somewhere. And he went ahead and run the riverboats from Jacksonville to Sanford for two years. And he got into the seafaring side of it and was running freight down the east coast of Florida. In the old records, it says his ship. Now I don’t know if it was his boat, but he wrecked it at Cape Canaveral and he lost his money. He moved back to Tattnall County where he joined the Confederacy, made rank and officer. He was with the Confederacy on the western front the whole time from the beginning to the end of the Civil War. One of the lucky survivors of the mess. And returned to Tattnall County and became a school teacher. And finished up, he was the Clerk of the Board of Education for Tattnall County, Georgia. And the reason why I was kind of getting into that was because it seems like all the Hughey’s were well educated. John Hughey had, he was married to his first wife who was an educated lady. She died after they had ten kids. He remarried and had ten more kids. His second wife, her husband was a well known doctor, and she had been to college and she insisted that all the children had a good education including her ten step children. So everything I’ve read about them, they were all educated people. And if you read some of the old scripts from James Perry, his hand writing is immaculate. And so, he’s all time wheeling and dealing. He sold a bunch of property in Orange County. Of course, he’s the clerk of court, but you can tell he was kind of a sharp fella. And the only other one I know for a fact on that line of the family is he had another brother, George that was killed by the Indians during the Seminole Wars. The papers from Georgia says it was in the mid- 1850’s when he was a member of the Florida militia he was killed by the Seminole Indians, short and dry. I found where he was mustered in the Florida militia about that time period, 1850, but I haven’t found records of his death yet. But all the old family rumors were that he was shot with an arrow around Lake Okeechobee and he didn’t die then, but he died about two weeks later from pneumonia. And so, that’s pretty much Hughey, J. P. Hughey, that I know. Prior to the Civil War and during the Civil War he was also a mail carrier before he took his elected positions at the court. He was a mail carrier and he also had freight wagons. And he hauled freight back and forth from Orlando to Gainesville. And he had to go through Union blockades. They were checking shipments going both directions. There seems to be some evidence from family that some stuff he might have been hauling north was to aid the Confederacy. I don’t have proof of that, but that’s what some of the old family stories were. He would haul hidden stuff in the bottom of his freight wagons, normal freight that was going to Gainesville and then bring mostly provisions back south. And then I also heard rumors that he knew certain ways that he would go around the union lines at a certain point. But the way I understand it then in 1870 when he got elected clerk of court there was some question about his eligibility for being clerk because he had possible aided the Confederacy. 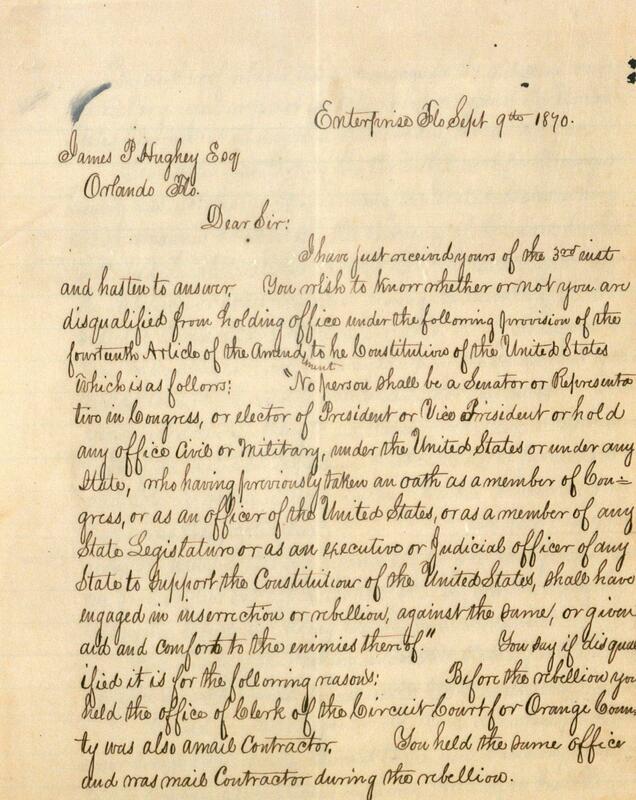 And they had a hearing at Enterprise, Florida, and a judge, I got a copy of the letter, the judge exonerated him from committing any crime by aiding the Confederacy. Letter to James P. Hughey from Judge Price, 1870. So, after he got that letter from the judge he was able to continue his position as clerk of the circuit court…. I’ve got that and I’ve got the only known picture of J.P. Hughey and his family…. J.P. Hughey’s son, Thomas, moved to Osceola County, what is now known as Hilliard Island Road. And the story I’ve always heard… he left here and he bought 5,000 acres in that Hilliard Island area for $2.00 an acre under contract with the government since he was moving so far south that he couldn’t expect the Calvary to protect him from the Indians. And we were still having some skirmishes with the Indians at that time. But the wars was pretty much over and he and his wife moved to what is Hilliard Island, pretty much what they call the west edge of Lake Tohopekaliga in St. Cloud bought that 5,000, him and his wife, they never really liked that area or that part that he bought. And sold it eight or nine years later to J. K. Hilliard, who it’s named for at $8.00 an acre. So he made money off the deal. They didn’t move far. they stayed in that Hilliard Island area and rest of my kinfolk come right out of that Hilliard Island area and stayed in Kissimmee. One of the funny family stories about him was he was getting on up in age. He married Susan Barber, which was the granddaughter or grand niece of Mose Barber. And the old rumor was that his vision wasn’t great anymore and whatever Indians came through there he always gave her the gun because she was a better shot than he was. Now whether that’s true or not I couldn’t tell you, but that was the old rumor. They say she was a pretty tough old woman from what I hear…. My grandmother remembers picking her up, Susan Barber Hughey. And, of course, the only settlement here at this time was Orlando. And she would drive back to Orlando because there used to be a dry goods store here in Orlando called Purcell’s. [West Church Street] was the only place my great grandmother would shop. So my grandmother would pick her up and drive her to Purcell’s in Orlando…. The same Thomas Barber, Susan, prior to them getting married, he had a run in with her kin folk. Allegedly over someone sold someone else’s pigs and I don’t know which way it went. And one of her cousins shot him, and in the knee. And he had to have a peg leg the rest of his life. And all my great uncles would tell me, he would walk around and say, “Damn old Barbers.” That’s the way he talked about it. Then he married one. But it seemed like everybody back in that era was tough crackers. Tough crackers, that’s the way they lived. The short side of the story, after him was my Grandfather Charlie and my daddy. They were pretty much in the livestock trucking business for all their lives. 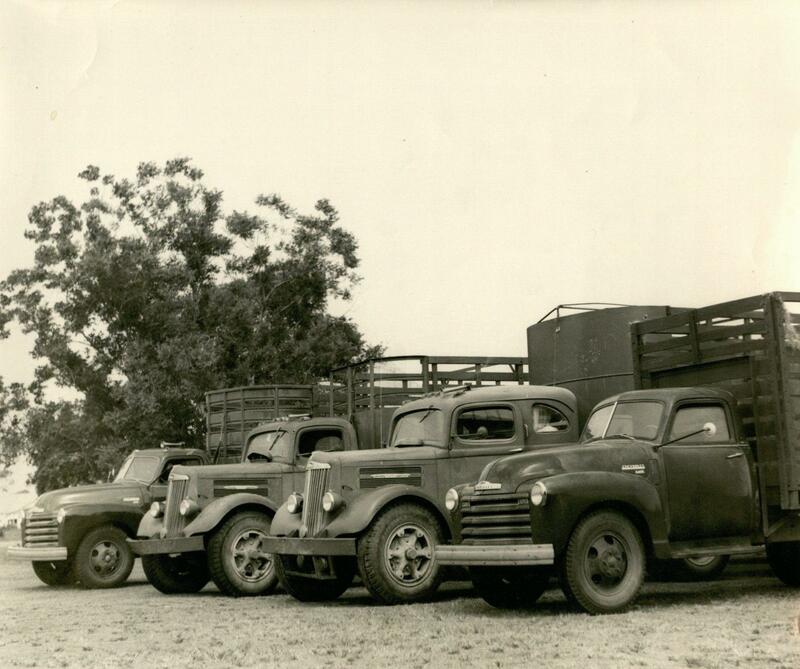 Hughey company trucks for hauling livestock. Did you know your grandfather? No, I did not know my Grandfather Hughey. He died when I was three. I was with my grandmother a lot so I knew a lot about my grandfather from my grandmother and also from my own dad. And then I had great uncles and stuff. Every one of them it seems like, every one of them got involved in some way with the Confederacy. The John Hughey that came over here from Ireland, of course, he had eight or nine young ins, four of his boys joined the Continental Army…. But one of them, the oldest one joined the Continental Army…. the other three of his sons just reading the old records it says they were enlisted with Colonel Thomas Brandon with the Continental Army just before the fall of Charleston, that’s all it says. And that was 1870. 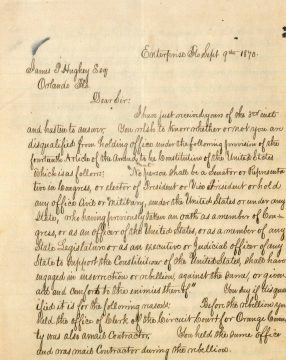 Like I said, George Hughey, I’ve got copies of him where he was a member of the Florida Militia from the State Archives. So it did confirm the story from Georgia that he was killed by the Indians. It doesn’t say that he was killed, it doesn’t show that he was killed, but the book, the record from Georgia Archives say that he was killed. So it’s just kind of piecing it all together…. In my lifetime Orlando was small town. And I remember when it finely grew a little bit out toward the Sand Lake area where the mall and stuff is. Other than that, Orlando was a small town in my lifetime. Orange Blossom Trail to Kissimmee was there, but it was empty. Everything on the west side of Orange Blossom Trail from Kissimmee to Orlando was owned by Horace Prescott, a big rancher. In fact, his son and me are lifelong buddies. He lives down the road a mile from me. It’s hard to imagine someone owning all that property from Kissimmee to Orlando everything on the west side of the road belonged to one man: Horace Prescott. And it went a couple of miles west. But we got Osceola County, coming in my time, the year I graduated, Osceola County had a population of about 12,000. And that was 1968 and now it’s 400,000. We’ve got 20 ranches in Osceola County that’s over 20,000 acres. We got two or three in the 50,000 acre range and then, of course, we got Deseret which is 320,000 acres. 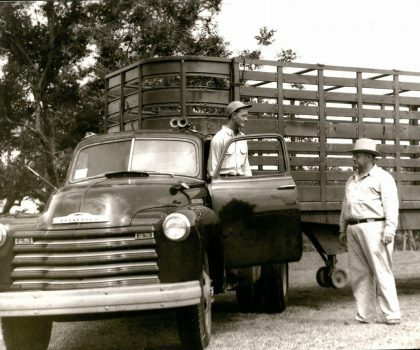 Osceola is still, even though it got Disney or half of Disney, we’re still an agriculture community…. [Deseret] they’re the largest landowner east of the Mississippi. And they just bought another 300,000 acres plus outside of Tallahassee. They just purchased the St. Joe Paper Company. Yeah, they just bought the St. Joe Paper Company out. 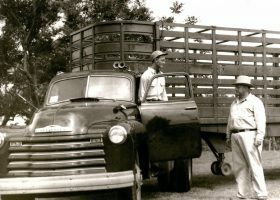 Are there still family owned ranches? Oh, every one of them. Every one of them are all family: the Barton’s, the Bronson’s, the Overstreets. Deseret which is the Mormon Ranch is a church owned, but all the rest of them, oh gosh, two or three different branches of the Bronson family own 40,000 acres; 30,000 acres. Barton’s have kind of subdivided theirs up between their seven grand young ins. Each one of the seven grand young ins got somewhere in the neighborhood of 15,000 acres each. One of the Barton’s went to Texas. A couple of them had moved to Texas and invested in large ranches out there. But one came back. Some of the Whaley family went to Texas and bought large properties. They came back and their main residence is in Osceola County. I could have brought my map of all the Osceola County ranches and how many thousands of acres. You got Kissimmee, the southern tip of Disney, St. Cloud in the northwest corner of Osceola County, and all the rest of Osceola County which is huge in size is mostly either big ranches or groves. And groves are about a thing of the past. The ranches that you’re naming, this would be cattle ranching? We don’t have any emus. It’s all cattle. This would be the cattle that we buy at Publix, that feeds our country? Here’s the way it works. The cattle ranches in Florida, 95% of them are what they call calf crops. Florida is either the first or second largest cattle producer in the United States. What the ranchers, the way they make their money in Florida is they take their calves, they ship them to Texas and Oklahoma which is the feed lots, which is what I did from the time I got out of high school to 1974. 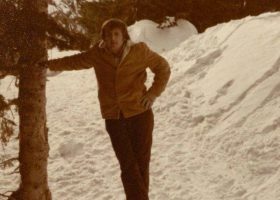 Kenneth Hughey stopped to see Rocky Mountain National Park while hauling cattle to a big ranch in Fort Collins, Colorado, circa 1970’s. And we’d haul them to those huge feed lots in Texas, north Texas and Oklahoma, and they would continue feeding them there until they become fat and they become Grade A beef. 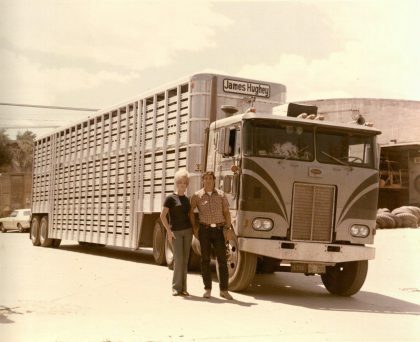 A James Hughey trailer truck pictured with two employees, circa 1970s. 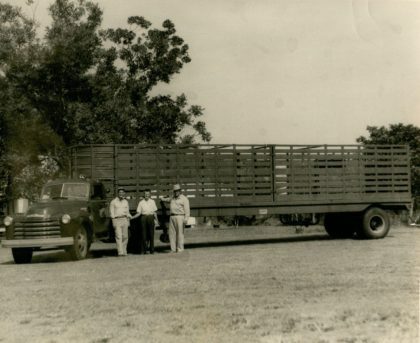 Things have changed over the years, but we were bringing the fat cattle back to like Swift meat packers in Oklahoma where they would butcher them. Pretty much now, everything, the whole system, is done in Texas and Oklahoma now where they fatten them up and take them. They got some slaughter houses out there where they do 5,000 head a day. But mostly, Florida is a calf producing crop. We would grow their calves, ship them to Texas, Oklahoma, they would fatten them up and we’d either bring them back or they would be butchered. And all your beef, they call it “Western beef” when you go to Winn Dixie or Publix or whatever. 85%, 90% of that beef you’re getting from the calf that started in Florida. So that’s kind of the way the system works. And what it boils down to is Florida has got so much hot and humidity compared to Texas. 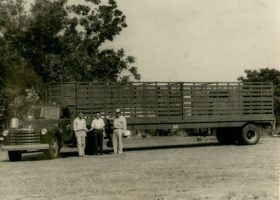 The way they used to describe it was, if you took one load of calves to Texas and fatten them up it would take you 20 loads of feed to bring from Texas to Florida to fatten them out to the same. So you couldn’t, it wasn’t worth the money. Weight gain was a lot slower in Florida. Pour feed to them, they gain 2 1/2 lbs. a day. In Texas they were gaining 4 lbs. a day. But you pay 20 times the freight to haul feed from Texas back to Florida compared to haul calves to Texas. If that makes sense. They’ve tried to have feed lots and slaughter houses in Florida. They were never really successful. A couple have done pretty well. Lykes Brothers got a slaughterhouse in Tampa. They’ve done quite well. And there’s a few. There’s a smaller one in Centerhill, Florida. It’s called Central [Beef] Packing. They’re bringing a lot of the cattle back from Texas custom cut. But it’s the same beef that they fatten out in Texas, slaughter. Then they put them on frozen food trucks, come back to Florida. Steaks are all boxed now. Well, we still have it. We’ve had several. Some of the big ranchers have put some of their cattle in the pens to separate them. And they leave them to the morning and separate them and work out. And come back next morning and the cattle would be gone. People would cut the gate and back a tractor trailer up there and load their cows on a tractor trailer. We just arrested one boy from Gainesville he stole about 16 head and took them to Arcadia Livestock Market and sold them under a false name in Arcadia. But, it’s still rustling. I tell you another old story I know pretty much for true. When Thomas Hughey moved to Hilliard Island, which is northern Osceola County, there was a lot of open range still there at that time. So the Hugheys had cattle, the Barber’s had cattle which he was still kind of feuding with because they shot off his leg. The Barber family and the Bass family they all had cattle on the open range that mixed together. Those were the days when branding and stuff was really important. Well, someone come along and stole a bunch of their cattle. And this was in horse and buggy days. Where they did it with horses and run them south to – they were heading south toward Okeechobee with them. Well, the Hughey’s, and the Barbers, and the Basses all joined up and went after them. And they caught up with them about where present day Yeehaw Junction is. And from all accounts, they didn’t kill any of them, but they bull whipped them pretty bad. And tied them to their horses and sent their horses on south and brought their cattle back. Then they cut out with the brand what cattle. And they kind of took the law in their own hands and sent the rustlers on being drugged by their horses southbound. And after they whipped them with the bullwhip pretty good and that kind of ended the feud between the barbers and the Hughey’s. And then he decided to marry one. She was probably the only pretty girl around at that time and she shot straight…. My Grandmother Simmons on my mother’s side, probably three out of four Sundays you would go to her house after church on Sunday. We went to church every Sunday. We would go to her house three out of four Sundays of the month and she would have hams, roast beef, and all the fresh vegetables you could think of laying out. I mean it was a feast. She always cooked the hams and the roast beefs and stuff all week. Then her and her husband would eat leftovers the rest of the week. She cooked one day. Now she wasn’t a church going lady, but she sure fed us good after. Grandma Hughey could cook too, but she didn’t. We lived right next door to her so me and my brother could go eat with her anytime. They lived in St. Cloud and me and my brother, my parents, and my grandmother lived right there in Kissimmee… we went to First Christian Church in Kissimmee for years and years. My Grandmother Hughey was Baptist and eventually I started going with her and I became Baptist. We’re all pretty much Baptist now, this side of the family for some reason. We’re on the Simmons side of the family now, my mother’s side. My great aunt lived out there. In fact, I bought a piece of property from her that’s how I moved out there. When we have family reunions once a year, there’d be a hundred people there and it was beautiful. Oak hammock, oak leaves, the lake kind of makes a figure eight and there’s two points, old timers call that Huckleberry Point. You can sit back under that Oak Hammock and eat an awful big table of food. You know it was just a dozen houses on the lake at that time. Hickory Tree Road goes way back. 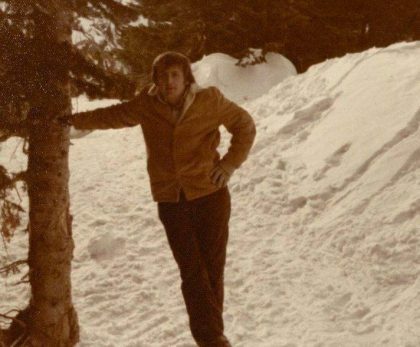 When my grandfather was a young man he built a cabin. There was a hickory tree hammock on the corner of the lake down there. And there’s no hickory trees in Florida to speak of, but for somehow or another there wound up being a tree hammock down on that part of the lake and it’s where my grandfather built a house down there, a log house. And they lived in it for years and years, but over a time period those hickory trees have died. And it’s all now a big citrus grove and that’s how it got it’s name Hickory Tree Road. Nobody even seen a hickory tree in Florida, but they had a small hammock of hickory trees down there. He moved right in there. Is the cabin still there that your father built? No, it’s gone. It’s all a big orange grove now. The house that I remember that he lived in on CT, big two story house. It’s still there and people kept it up, very nice. He had about 350 acres there, a couple cows, a couple horses. Milked his own cow when I was little. I’d go help him milk the cow. And then I’d sit there and churn butter with an old Handcranked churn until I was wore out. And then grandpa would take the churn away from me and finish making the butter. His wife, my grandmother, she got in the backyard and would catch a chicken and wring its head and next thing you know that chicken is going in a pot…. Thomas Albert Hughey and his wife, Susan Barber, with their grandson Albert, circa 1870. 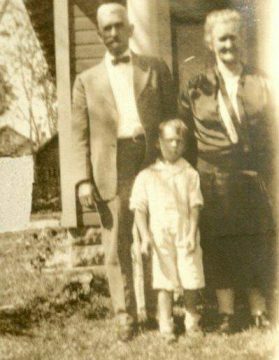 This picture here with the elderly gentleman and the lady and the little boy in the white suit that is Thomas Albert Hughey and his wife Susan Barber, and that is their grandson Albert…. He was the son of James Perry Hughey that moved to Osceola County during the time that James Perry was here in Orlando. 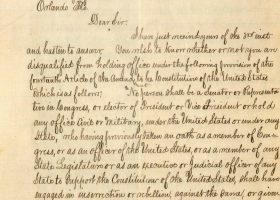 He bought a large tract of land in Osceola County… he signed the contract with the Army that he would not expect the Army to protect him from Indians. Seminole War was pretty much over, but there were still little skirmishes here and there. And the old family joke that went around was that his vision was getting kind of bad in his older age and he always would give the gun to his wife Susan because she was a better shot than he was. If that’s true or not, I don’t know, but that’s what the old family always said…. Susan Barber, and, just for your information her daddy, Andrew Jackson Barber, who was raised by Mose Barber. There’s a famous story around here about him killing Sherriff Mizell. But Andrew Jackson Barber, his daddy was William Barber, but he was killed when he was two by the Indians just outside of Jacksonville. And then Mose Barber raised Andrew Jackson Barber and his sister as his own children. So technically she was kind of raised as a granddaughter of Mose Barber more than a niece, but she was technically a niece. 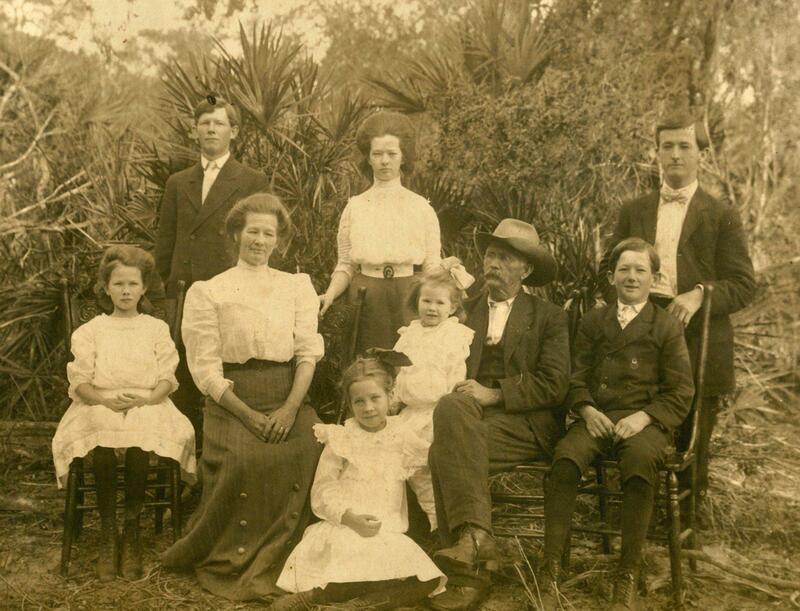 I did show you the picture of my other grandfather, James Perry Hughey, the older man sitting in the picture with the hat. This had to be his second wife because he had five or six kids. His wife died and he remarried in 1856 and she had two little girls. Her name was Emma McLeod and all I really know about her was her husband was a Confederate officer who was killed in battle in South Carolina. Somehow another she come to Florida and she met up with James Perry and he married her. Based on the number of kids in the picture that’s got to be his second wife Emma and the two little girls she had from her first husband…. that photo was taken somehow right here in downtown Orlando. He homesteaded 160 acres on Lake Lucerne. I got a feeling that picture was taken right here pretty close. I mean, if you read the old maps and geological surveys, his cabin that he built right here on Lake Lucerne probably sitting within a few feet of where your City Hall is sitting now. They said it was on the northwest corner of the lake, and it named two streets that no longer exist. But that was probably taken somewhere in that area there. I did show you the old picture that’s my father and that’s my grandfather. 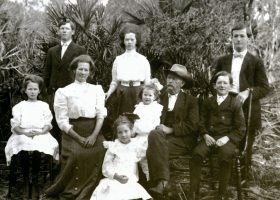 James Hughey and his father, Charlie Hughey, far right. He had just taken delivery of that new 1956 Chevy truck with a cattle trail behind it. 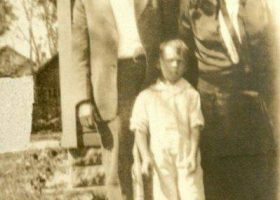 Charlie Hughey, pictured far right with his son, James Hughey, and the Chevrolet salesman standing in the middle. Of course, I have a few pictures there of an old accident I guess you’d call it. One of daddy’s old cattle trucks out there on the Deseret Ranch in an area they call the Sun Grove. The cattle truck was crossing the bridge and the bridge collapsed with the cattle in it and the cowboys had to get all the cows out…. 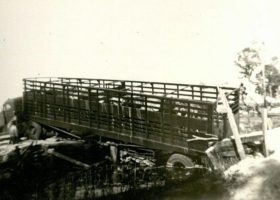 Collapsed Bridge at Sun Grove. Fortunately, I can say what little I found about Hughey – all being hard working, decent people. None of them ever stole any cattle or got hung that I know about. On my momma’s side there’s a couple in question. Oral history interview with Mr. Ken Hughey at the Orlando Public Library on July 13, 2016. Listen as Kenneth Hughey describes the letter to his great, great grandfather James P. Hughey in this excerpt from an oral history interview with Kenneth Hughey at the Orlando Public Library on July 13, 2016. James P. Hughey settled 160 acres on Lake Lucerne around 1855. In 1870, he became the first clerk of the circuit court, and in 1875 he became the clerk of the City of Orlando. He also served as the treasurer of the Orange County Public School System.